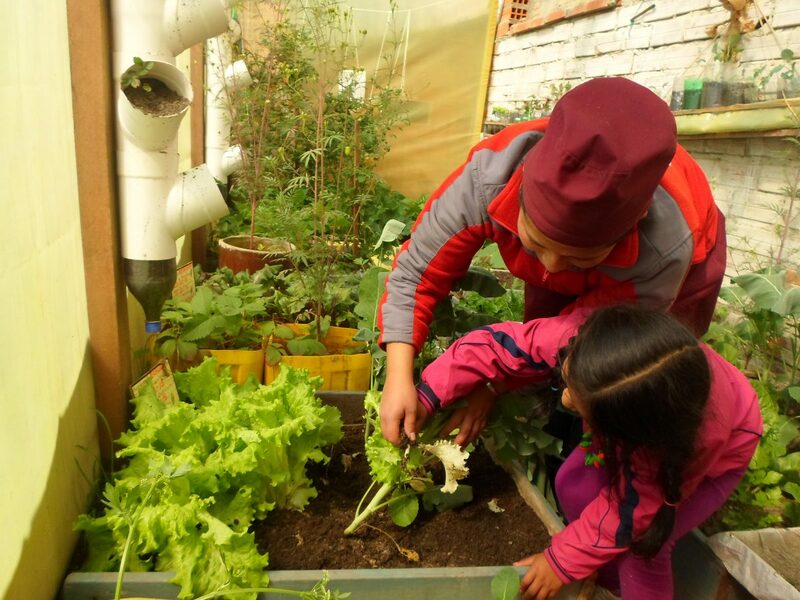 Children learn how to grow and harvest fruits and vegetables with guidance from teachers. In rural areas of Bolivia, Indigenous people have carried forward the tradition of “Apthapi” (a word that comes from the Aymara native language that means to share) where families come together to share food and meals together. It was this tradition that inspired our local partner SCSJ to connect families through a series of healthy food tasting fairs, which brought gardening, nutrition education, and professional chefs together over a shared meal. Rural communities in Bolivia face a high dependence on carbohydrates in their diet, in part because of the difficulty in accessing and affording fruit and vegetables. This has negatively impacted the health of children and families in the area. To address this, children have been learning how to garden at school and through community centres, while parents and families have been learning how to grow fruit and vegetables right at home. The gardens have been a great success – nearly 65% of all families in the area are participating in urban agriculture at home. But growing food is just the first step. Students and families have been learning more about nutrition, and the importance of a balanced diet, especially for growing children. They’ve also received support to help change dietary and cooking habits, which centered heavily on unhealthy foods. Chefs volunteered their time to teach community members new healthy recipes using produce grown in local gardens. Youth food advocates have also come together through youth committees on food security, learning how to identify their communities’ greatest challenges and raise awareness. They have been busy teaching their peers, parents and community members about nutrition and gardening through door-to-door campaigns. The tasting fairs – which local youth helped to organize – brought all of this learning together. Families brought fresh food harvested from their home gardens to share with their community. 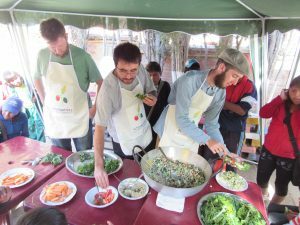 Professional chefs and restaurant owners from the city of La Paz volunteered their time to cook. The chefs showed children and parents how to make delicious food from the raw ingredients they had brought through demonstrations, and they shared nutritious, easy and inexpensive recipes. Then communities sat down together to share a meal, embracing the tradition of Apthapi and empowered with the knowledge and skills necessary to ensure their right to food.